Barley Risotto is lush with Littleneck clams, leeks, oregano and a little crunch. “Carrots Wellington.” Amusing. Certainly an original. Call it candy for vegans. Worth a tweet and a titter. My skeptical dining companion, an unabashed carnivore, is surprised to find himself bypassing slow-roasted bone-in ribeye in favor of Chef John Fraser’s carrot whimsy. He even agrees with me that it’s actually, well, sort of good. The pastry effect. “But how many times in your life are you going to want to eat Carrots Wellington?” he asks quite sensibly. 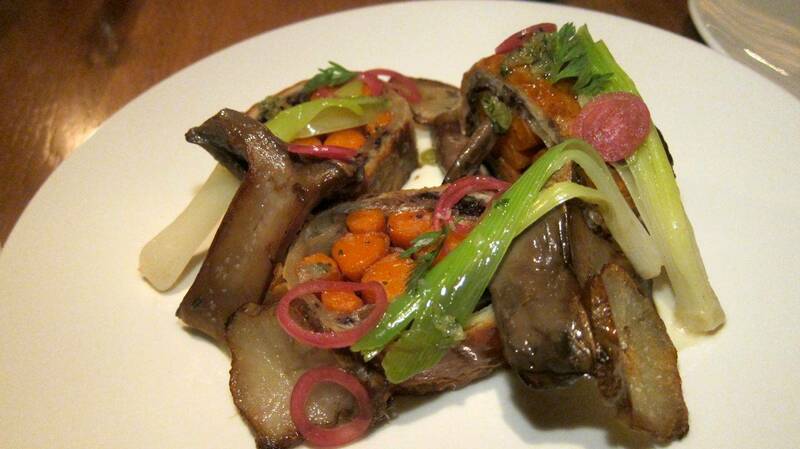 Carrots Wellington, wrapped in phyllo pastry, with scattered bluefoot mushrooms and sunchokes. We’re just two of us tonight at Narcissa at the foot of André Balazs’ refurbished Standard, East Village Hotel, the futuristic tower looming over Cooper Square. As I waited for him to arrive, I imagined the $14 tequila-mescal Fly Me to Tulum cocktail actually transporting me to that archeological dig in the Yucatán. I’ve been recognized and moved from a kindergarten table to a booth for four against a wall of glass overlooking the patio. The room is comfortably low-key, modest, underdone even, cream and beige in the fading daylight. Could this be a bridal shower at the next table? Early birds in the patio room are mostly hotel guests. We early birds are not classic Balazs pretties, not a Chateau Marmont or a Sunset Beach entourage, for sure. I suspect some of these exhausted folks with shopping bags are hotel guests. My friend huffs in belatedly -- Narcissa’s entrance is a challenge for taxis to reach -- and we explore the menu, balancing the familiar with the bizarre, ordering a dish or two we think we’ll like and tossing in the exotic unknown. There’s something about great bread that fills even a veggie naysayer with hope for dinner. It’s the bread that starts the seduction. 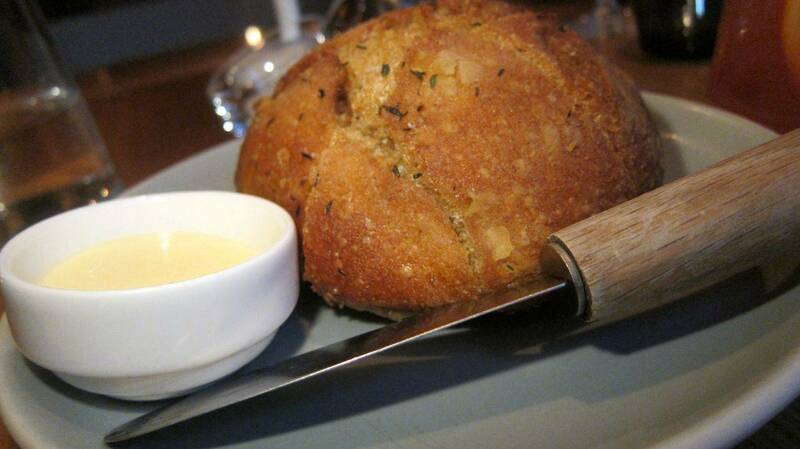 A warm, splendidly crusty round, perfect for four. It tastes of butter even without a dab from the lemon butter alongside. 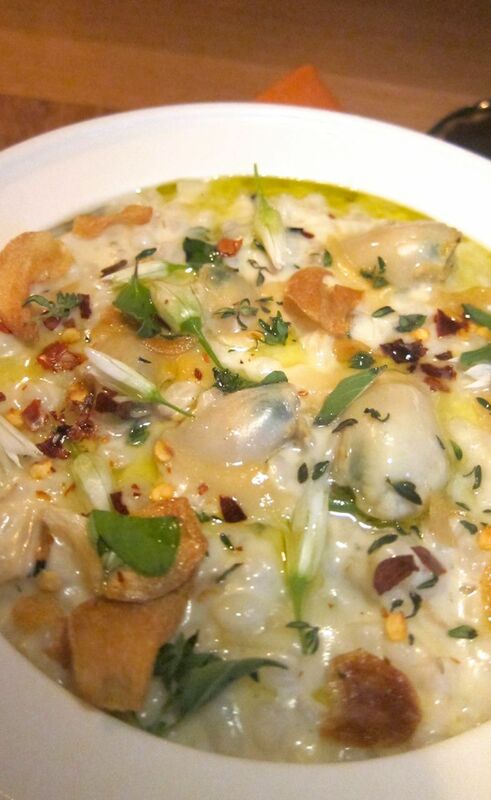 We’re excited to actually savor the lush barley risotto with leeks and plump little clams. It’s our favorite. 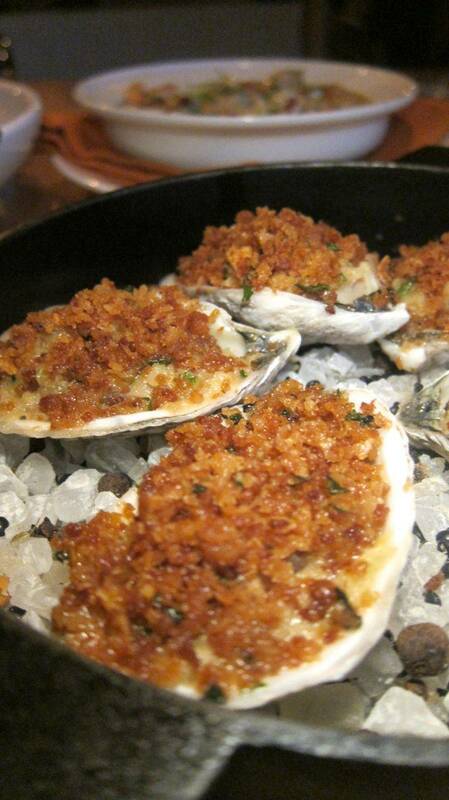 There is something elusive in the baked oysters with “melted cabbage” in truffle-bonito butter. In a scrimmage of cabbage, butter and truffle, I’m not sure I detect the bonito. 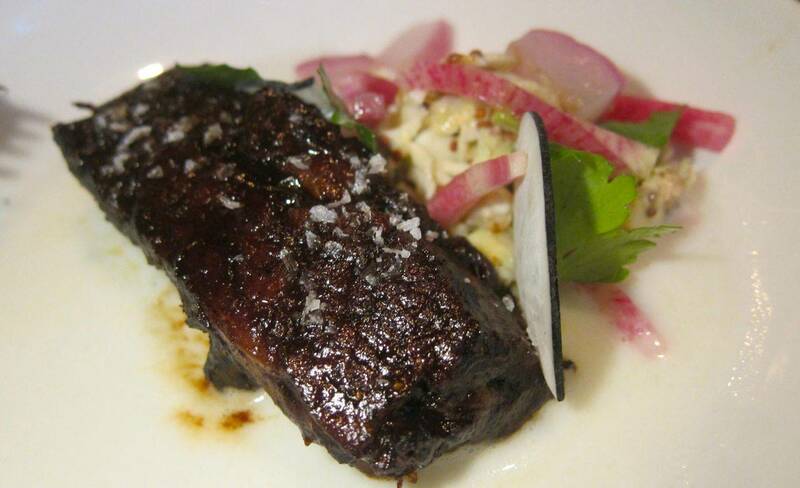 And the grilled short rib with radish salad seems calculated among the wholesome farm-to-table starters to defang the carnivores. These oysters have been baked with melting cabbage, truffle-bonito butter and crumb rubble. I didn’t expect to like Narcissa. It sounded overly precious to me. Fried carrots. Rotisserie-crisped beets. I was a cheerleader for Fraser when he opened at Dovetail on West 77th Street, though the prices seemed high then for the neighborhood. My guy and I were regulars at the less expensive Sunday supper. I recall making a fuss that a thigh and a wing had totally disappeared when the waiter parading our perfect whole chicken took it back to the kitchen for carving. Carnivore’s Amuse: Pastrami spicing leaves this caramelized short rib over salty. 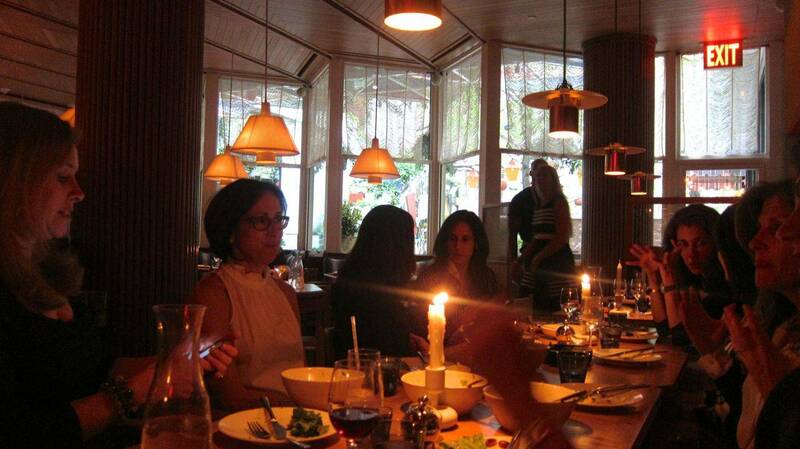 The Michelin-starred chef’s Nolita popup, What Happens When, got a plus from me too. But I feared Narcissa might be too avant-garde. Or too solipsistically vegan. And anyway I couldn’t get in. I certainly tried, anonymously, of course. The voice on the phone offered tables only at 6:30 and 9:30. But my friend Wilfred knew someone. So here we are at 7. 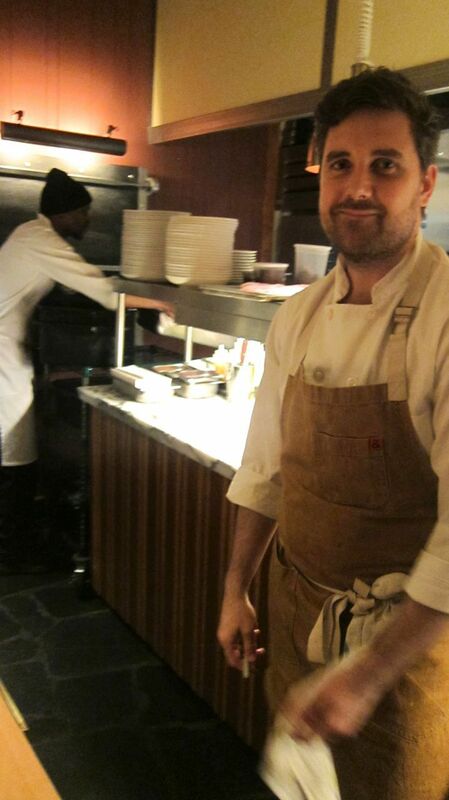 Chef John Fraser captains the kitchen, schmoozes the dining room, and keeps traffic flowing. In the more frenetic front room, Fraser fans can watch the kitchen action and the chef himself at the end of a counter, calling the orders. Fraser had seen me walking in and wants to know why I haven’t come sooner. I explain about not liking dinner at 6 pm. Later, my friend and I have barely made a dent in the rotisserie-grilled sweet potato with jerk spices and tofu aioli -- admiring it, but not really liking it, if you know what I mean. I’m noticing how filling root vegetables can be just as two more dishes arrive. 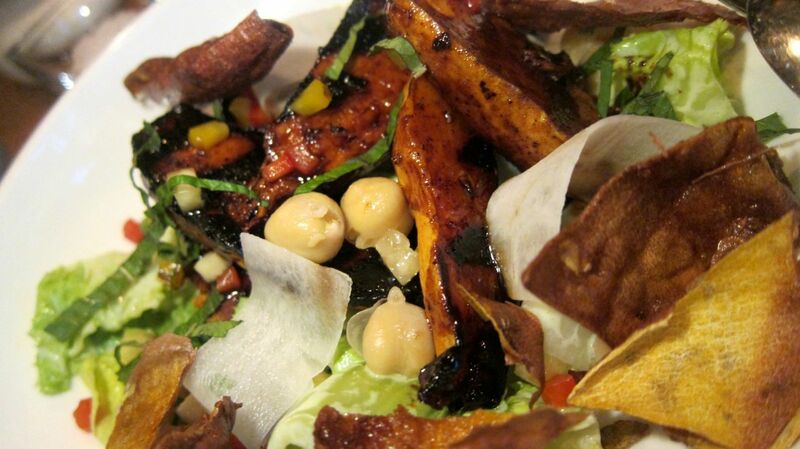 Jerk spices and tofu aioli slick thick batons of rotisserie-grilled sweet potato. “From the kitchen,” the runner announces. 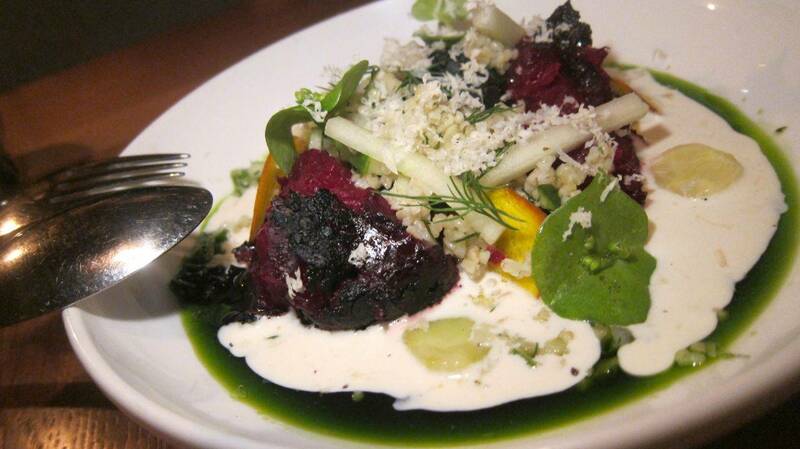 The rotisserie-crisped beets, blackened by their long ride, are not merely crisped, they’re beyond caramelized, singed actually, and yet marvelous, sitting like boulders from the moon on bulgur salad with apples alongside a swath of horseradish cream. 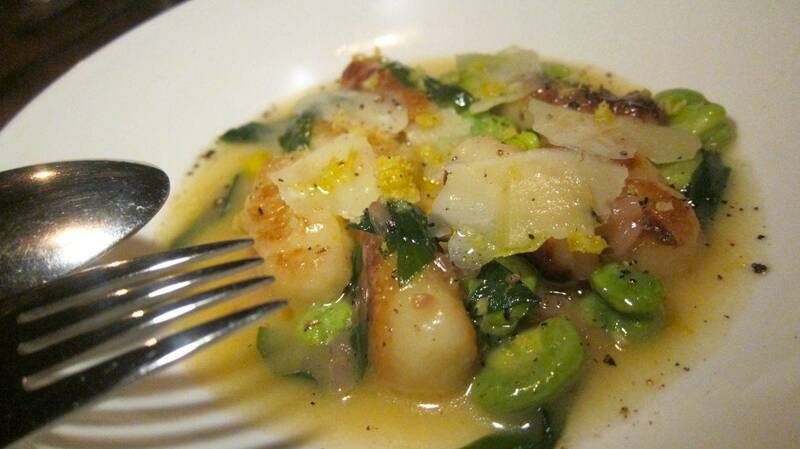 Sadly, melted Parmesan leaves a greasy puddle on the potato gnocchi with ramps and favas. Hours on the rotisserie leave these beets deliciously singed, to be tucked atop bulgur salad. Then comes the elegant Wellington I deemed essential to the Narcissa experience, plus the redundant side of fried carrots I had to taste. The thin ends are delicious; the fat ends too raw. Chunks of barely chewable bread in the asparagus panzanella side dish defeat what might make an appealing starter. 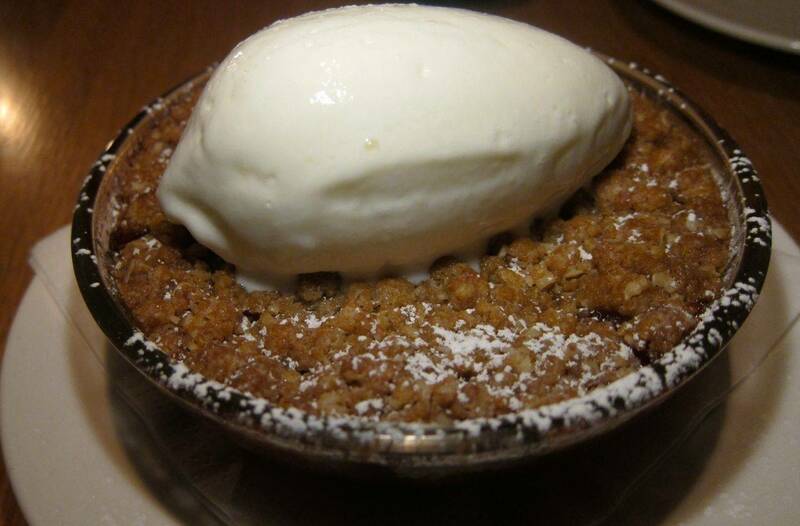 Good soldiers that we are, we order dessert: the warm apple-huckleberry crisp with sour cream ice cream. It needs to be fruitier, less sweet. Though congenital narcissists so thoroughly stuffed might not be totally trusted. Melted parmesan leaves a heavy slick of fat on what might otherwise be appealing gnocchi. “Would we come back?” I ask. Probably not, we agree, even though, except for occasionally over-salting, most of what we’ve eaten is pretty good and some has been exciting. Again, we agree. Interesting doesn’t mean good. Maybe we’ll crave that astonishing barley risotto. Indeed. “I might be back for that,” he says. 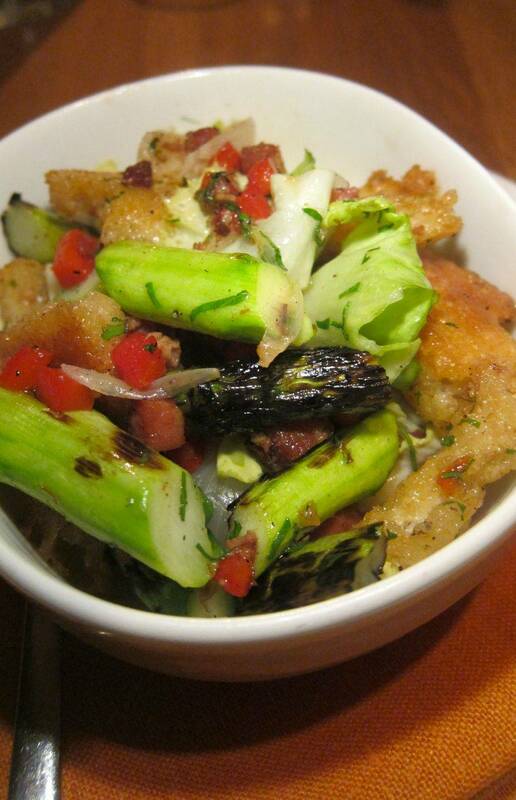 I found this asparagus panzanella among the $6 sides – alas the croutons are too tough to chew. Back home, I settle in for just one half hour of “The Big Bang Theory.” The commercials run on forever. I study Narcissa’s menu. There are nine entrées I’ve not tasted. Maybe I need to try the lacquered duck breast with rhubarb and the Maine scallops with crayfish and an asparagus stew. It doesn’t seem fair to rudely dismiss such a creative effort in so soothing a spot without one more visit. I invariable go for the crisp or the crumble. This apple-huckleberry bake was too sweet. Perhaps I can recruit an adventurer with a car. I definitely meant to try the citrus salad for dessert. Maybe even the bitter chocolate tart. I might have to bring my vegetarian niece next time she’s in from Montana. Call it an Omnivore’s Dilemma. 21 Cooper Square between 5th Street and The Bowery. 212 228 3344. Sunday through Thursday 5:30 pm to 11:30 pm. Friday and Saturday to 12:30 pm. Sunday brunch 10:30 am to 4 pm.